Efren Reyes was the fan favorite at the first leg of the San Miguel Asian 9-Ball Tour, which took place May 5-7 at the Nguyen Du Sports Hall in Ho-Chin-Minh City, Vietnam. And “the Magician” didn’t disappoint, defeating Li He Wen of the Chinese Taipei, 11 – 6, in the finals to claim the trophy and the top prize of $10,000. With this win, Reyes has now won six leg titles in the Asian Tour, which will travel to Bangkok, Thailand for the second leg on June 2 – 4, followed by Kaohsiung, Taiwan, Aug. 4-6 and Jakarta, Indonesia, Sept. 15-17. The International Pool Tour has secured a major television package to air the lucrative tour’s debut event, the action-packed “King of the Hill 8-Ball Shootout” series on the Outdoor Life Network [OLN]. The network will carry the six IPT shows in prime time, with the first show set to premiere at 7 p.m. EST on Sunday, June 4. The Comcast-owned OLN is currently available in almost 70 million households nationwide. The network is best known for its coverage of the National Hockey League, the prestigious Tour De France, the America’s Cup, Davis Cup tennis, the A1 Grand Prix series and the “Survivor” reality series in syndication. The International Pool Tour’s “King of the Hill 8-Ball Shootout” features the world’s greatest players competing for more than $1 million in prize money. The series will be shown on OLN over six consecutive Sundays, culminating in a two-hour finale on Sunday, July 9, in which Mike Sigel and Efren Reyes face off in the final. The “IPT King of the Hill 8-Ball Shootout” was produced by the International Pool Tour in association with A. Smith & Company, the executive producers of network hits such as “Hell’s Kitchen,” “Skating with the Stars” and many major television sports events including pro football. After the last two years in Chinese-Taipei and Kaohsiung, Matchroom Sport has decided to push the envelope and stage the prestigious World Pool Championships in Manila this year, marking the first time that the annual event will be held in the Philippines. Matchroom Sport, headed by its chairman, British millionaire Barry Hearn, and Media Director Luke Riches will join ESPN Star Sports executives in Manila next week to finalize deals of what is reportedly a done deal. While hosting the World Pool Championships is a costly endeavor, the positive media opportunity is expected to be more than worthwhile, especially since pool-crazy Filipinos would love to see 1999 champion Efren “Bata” Reyes, 2004 winner Alex “The Lion” Pagulayan, 2002 runner-up Francisco “Django” Bustamante and promising stars such as “Marvelous” Marlon Manalo match their skills against the finest players from Chinese-Taipei, the U.S. and Europe, along with emerging talents from Japan and South Korea. Viva Sports/Manila Standard Today was informed that the top prize will be the biggest in the history of the World Pool Championships, running into six figures. No venue has been selected as of yet, but candidates include the Philippine International Convention Center, the World Trade Center and billionaire Henry Sy’s Mall of Asia. Miller’s Time: Jason dominated at Derby. It’s wasn’t too bad a week for Jason Miller, a sports bar owner from Dayton, Ohio. After hardly playing pool for a year, Miller arrived at the Eighth Annual Derby City Classic and wrested the Master of the Table title and its $20,000 prize from perennial all-around champion Efren Reyes. Then he strolled undefeated through a tough-as-nails 46-player qualification tournament for the International Pool Tour and won a berth on the million-dollar 8-ball circuit for 2006. So when we say Miller arrived at the nine-day Derby City Classic, held Jan. 5-14 at the Executive West Hotel in Louisville, Ky., we mean he really arrived. 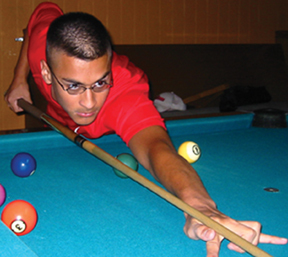 During the nine-day Derby endurance test, Miller won the 9-ball banks division, placed second in the one-pocket pack, and held on long enough for a 15th-place finish in the 9-ball contest. Reyes, who blitzed Miller 3-0 in the 20-minute one-pocket final, needed to top the 9-ball field to keep his Master of the Table title from 2005, but fell short in the semifinal versus fellow Filipino Rodolfo Luat. As the 9-ball division was wrapping up on Jan. 14, the IPT kicked off the first of its four qualifiers for a handful of open spots on the 150-player tour. Each of the 46 players paid a $2,000 entry fee, and the only reward would be tour cards for the top two finishers. The all-star field made for perhaps the most intimidating qualifier in pool history. At the top of the list was reigning U.S. Open champ Alex Pagulayan, but there wasn’t much of a drop-off from there, as the dream of competing on the IPT brought a passel of national 8-ball champs from the BCA and VNEA amateur leagues (Shane Van Boening, Brian Groce), 9-ball pros (Tang Hoa, Robb Saez, George Breedlove) and international studs like Hungary’s Vilmos Foldes, Germany’s Thomas Engert and the U.K.’s Imran Majid. Ralf Souquet felt almost as fortunate, breaking something of a dry spell to win the 9-ball division at Derby City. Among the top three players in he world in 2002, Souquet has struggled recently with physical and personal woes, and was seeking chiropractic treatment in Louisville for intense back pain during the Classic. After crushing Luat, 7-0, in the 9-ball final, Germany’s “The Kaiser” was all smiles. Prior to the International Pool Tour giving Mike Sigel the nickname of “Mike the Mouth”, he was simply known as “Captain Hook”. After Sigel’s match against Efren Reyes on Sunday at the IPT’s King of the Hill Invitational 8-Ball Shootout, he might want to start calling himself “Captain Hooked”. Sigel found himself in that very position numerous times in the match, and not always after a Reyes safety. The first set of the best two out of three match saw Reyes dominate Sigel on his way to an 8-0 win. Multiple times Reyes came up dry on the break but Sigel found himself without a good shot to get a run started. Unfortunately, on the rare times that Sigel did have a shot, he couldn’t get any momentum going. The second set started out the same with Reyes racing to a 4-0 lead until he came up dry on the break in the 5th game and Sigel negotiated a very complex table run to get on the board at 4-1. Sigel was able to then string together back to back table runs to get back to 4-3 but got a little careless while running out the next rack and ended up giving Reyes a chance at the table which Reyes capitalized on. Sigel won the next two games to tie the score at 5-5, and then the nerves started to set in as both players suffered surprising missed shots in the 11th game. Reyes was the first to get control of table and win the game for a 6-5 lead, and he then cruised through the final two racks for the 8-5 win. Reyes earned $200,000 for first place (the highest prize for first place at a pool tournament in the history of the game), while Sigel settled for $100,000 in second place prize money. It’s Sigel vs. Reyes for King of the Hill! In a dream match-up for pool fans, Hall-of-Famers Efren Reyes and Mike Sigel will meet in the finals of the International Pool Tour’s King of the Hill event on Sunday afternoon, playing for the biggest payday in the history of billiards. Forty-two of the world’s best cue artists started play on Nov. 30 at the Orange County Convention Center in Orlando, Fla. After four rounds of round-robin 8-ball play, Reyes emerged as the victor and earned a shot at Sigel and the $200,000 first-prize in the finals. In a typical gut-check performance for the legendary cue wizard, Reyes came back from a 4-0 deficit in a must-win match against fellow Filipino Marlon Manalo to win eight straight games and earn his berth against Sigel, 8-4. “I’m coming after you – you wait for me!” Reyes said, after repeated promptings from the video production staff at the King of the Hill to say something for the cameras that sounded like he was taunting Sigel. Just six players were left standing for the final round-robin stage on Saturday, and, perhaps to no one’s surprise, three were ball-control mavens from the Philippines: Reyes, Manalo, and Francisco Bustamante. Perhaps the biggest surprise survivor was Hall-of-Famer Nick Varner, who underwent major heart-related surgery less than two years ago. The six were rounded out by Finland’s Mika Immonen and America’s Johnny Archer. The Filipinos quickly took over the bracket, and going into the fifth and final match of the last round-robin, each Pinoy player had a record of 3-1. When Bustamante lost badly to Immonen to fall to 3-2, it was announced to the crowd and the players that the winner of the Reyes-Manalo match, which was still in progress, would meet Sigel in Sunday’s final. It was a wild match to begin with, as Manalo took a quick 4-0 lead. Reyes began to mount a comeback, and the score was 4-2 when play was forced to stop for 20 minutes after an incredible and embarrassing gaffe by the match’s referee. Reyes had run out all the solids and had a clear shot on the 8, and decided to return to his chair for a moment before taking the shot. Evidently not paying attention, the referee absent-mindedly cleared the balls from the table before Reyes returned. Fortunately, each match at the King of the Hill was being videotaped, so the production crew soon was able to cue up a portion of the tape with the correct layout. After officials reset the balls, Reyes promptly sank the 8. Soon, he was celebrating his big comeback and the potential to take home $200,000 from Sunday’s match. The runner-up will receive $100,000. Sigel told BD that he was concerned with Reyes’ stellar record in high-pressure situations. Perhaps not so coincidentally, Reyes holds the current record for most money won in a pool match: $160,000 for a Japanese event several years ago.